Raiders pull away for MVC victory. MONMOUTH — Early errors can take a team two ways. Either the mistakes can snowball, or they can snap a defense into focus. 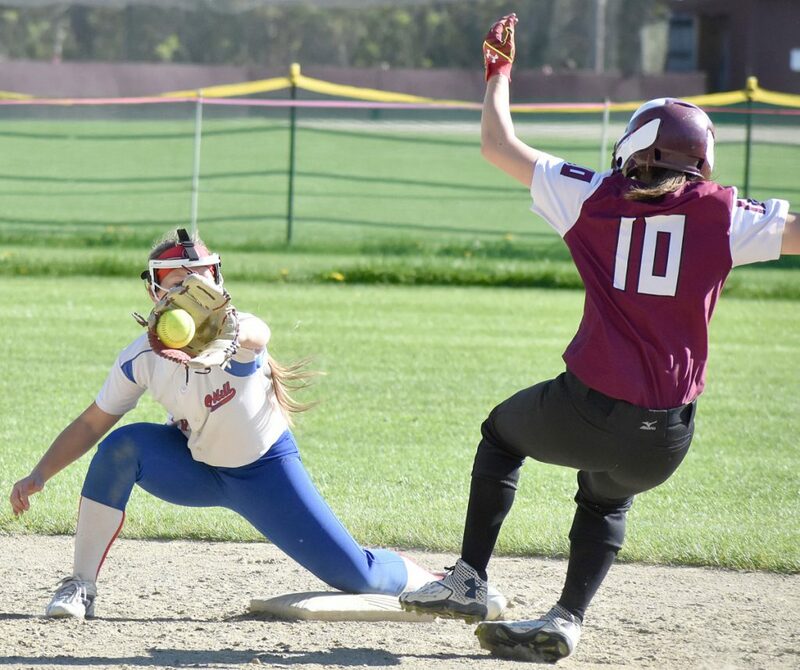 Oak Hill and Monmouth went separate ways after both teams made costly errors in the first inning of their Mountain Valley Conference softball matchup Friday, and for the Raiders that meant cleaning up defensively while taking advantage of the Mustangs’ mistakes offensively in a 6-1 victory. The Raiders (9-2) put runners at the corners after a second Mustangs (6-5) error in the top of the first. Molly Flaherty then doubled to drive in the game’s first run. Monmouth answered with a pair of hits against Oak Hill starting pitcher Sadie Waterman, then a Raiders error with two on and two out tied the game 1-1. The Mustangs made another error in the second to put two runners on with no outs. But a popped-up bunt and a double play by second baseman Abby Flanagan on a liner ended the threat. Oak Hill then took the wind out of Monmouth’s sails in the bottom half of the inning. Waterman struck out the first two batters, but Emma Johnson hit a two-out single to extend the inning. Raiders catcher Abby Nadeau ended it right after that by gunning down Johnson trying to steal second. The Raiders had a little two-out magic of their own at the plate in the top of the third. Nadeau singled and Flaherty walked on four Emily Chasse pitches. 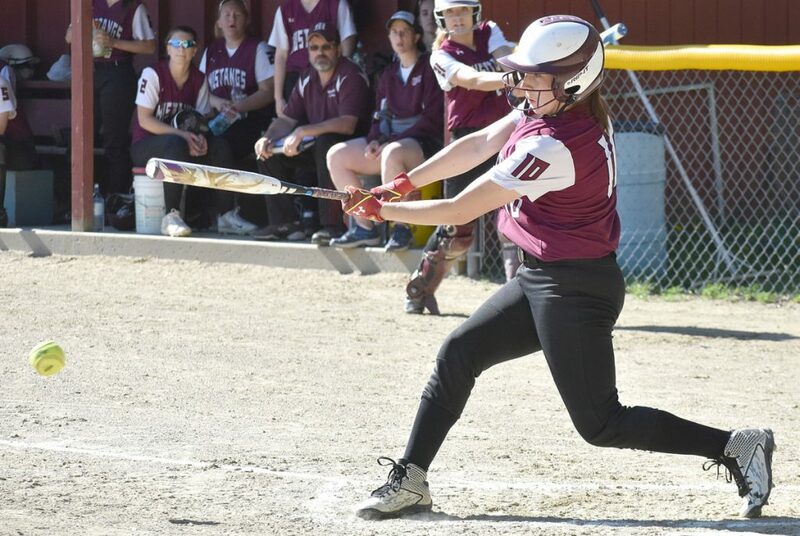 Julia Ahlberg looped a double into right-center to score Nadeau and make it 2-1, but Flaherty was easily out at home after some miscommunication on the basepaths by the Raiders. Chasse recovered in the next inning with the first of two clean innings — she also set down the Raiders 1-2-3 in the seventh. In the fifth she got out of another two-on, no-out situation. “She did her job today. She held them down, didn’t give up any big hits,” Mustangs co-coach Dave Kaplan said. The Raiders’ deepest hit came in their next turn at-bat. Ahlberg led off with a double into the left-center gap, then scored when Miranda Kramer’s grounder single went past the left fielder for another Mustangs error. After Chasse tossed her lone strikeout, pinch hitter Kaitlyn Ridley reached on another error. Waterman singled to load the bases, Mahala Smith drove in one run with a single, then Nadeau brought home two more runs two batters later to make it 6-1. The Mustangs tried answering, getting two runners in scoring position with two outs in the bottom of the sixth, but Waterman cleanly fielded Deanna Bauer’s grounder for the third out. She struck out the first two batters in the seventh before Smith made a running catch in center to end the game. 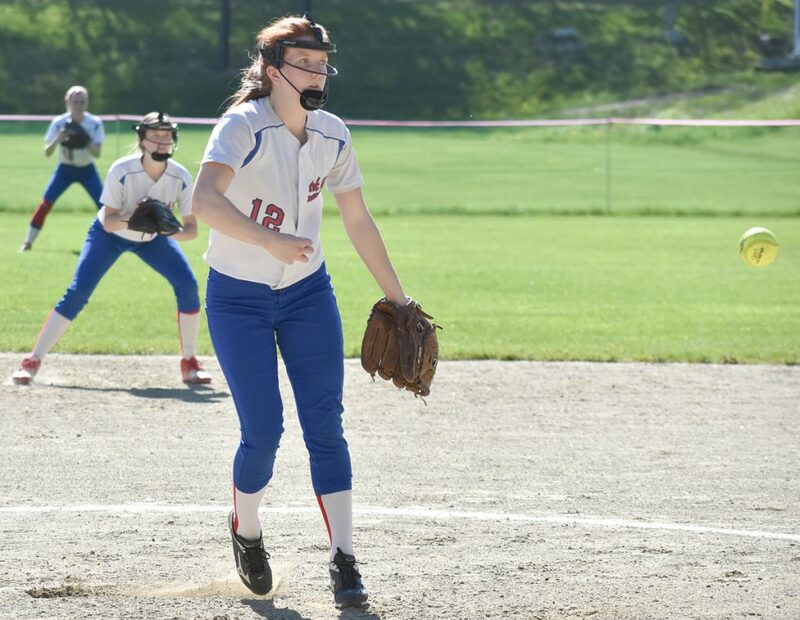 “The first inning was a little tough, but (Sadie) worked through it like she usually does and she got her pitches under control, and we mixed them well today,” Collins said. Waterman allowed just five hits, three of which were by Haylee Langlois, while striking out six. Kramer, Nadeau, Ahlberg, Waterman and Smith all had two hits against Chasse, who gave up 11 total.